1951 saw the placing of a future-oriented milestone in the Zillertal. 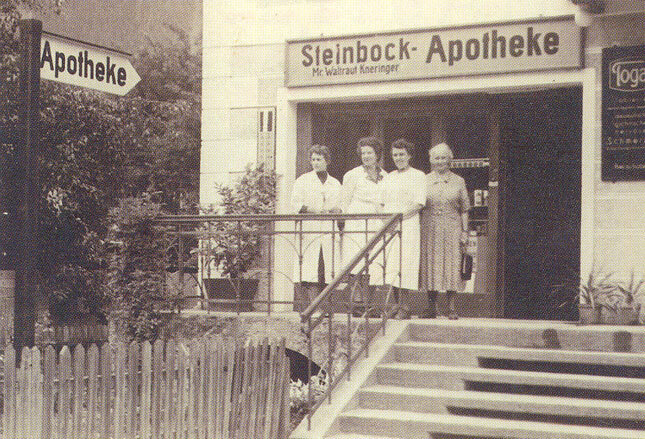 Mrs. Waltraut Kenringer took a bold step and opened the first public pharmacy in the small rural village of Mayrhofen in a time when tourism was in its infancy. In those days only a handful of hikers and mountaineers visited the beautiful mountain wilderness at the far end of the Zillertal. This was all going to change in 1956 with the completion of the Penken railway, which laid the foundation of today's booming winter tourism in this region. A ever growing number of holidaymakers, both in the summer and the winter months, challenged the capacity of the pharmacy. Bigger premises became a necessity and in 1960/61 the pharmacy moved to its present location on the town's high street. At the same time the staff was also doubled from three to six employees. 1996/97 heralded the digital age for the pharmacy in the ongoing pursuit of meeting the constantly growing demands of its customers. Notepad and pencil made way to laser-pens and computers. The premises were enlarged and offer our customers a wide variety of services. Staff numbers also rose to currently 10 employees, some of which have been with the pharmacy for 30 and 40 years. Our credo of "The customer's well being is our highest goal" is as valid today as it was in the early days - we live it daily and secure future growth and development of the pharmacy.